There are several Russian practices and customs that could add value to the lives of common Indians. A few weeks ago, when I wrote this article about common Indian practises that could be implemented in Russia, several Russian and Indian readers asked me to write about the reverse. There’s a lot I love about Russia, so restricting this article to 5 points is indeed difficult, and would mean narrowing it down to what I consider the best and most workable practices for India. 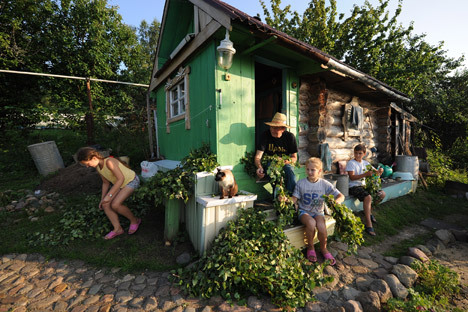 One of the real pleasures of the warm season in Russia is the ability to reconnect with Mother Earth and farm potatoes, as well as lay out flower beds and grow fruits on a small plot of land. The Soviets allocated land to city-dwellers for summer recreation, and being industrious, the Russian people managed to farm a decent amount of food that lasted a few months into the winter. It would be a great public health initiative if urban Indians were also allowed to have their own dachas or mini-farms on public land. Besides the physical workout, what could be more satisfying and healthier than growing one’s own food? As someone who has mint, ginger, turmeric, basil and several other plants in his balcony and window grills, I would love to go off to the far off suburbs of Mumbai on weekends and be a part-time farmer. Given the fact that there is a nexus between civil servants and greedy developers, an initiative like this in India seems like a pipe-dream. The knives will be out for this one, but I think way too many young men in India are spoilt, lazy and undisciplined. I really think that a year of military service should be obligatory in the country, despite the fact that India has a professional army. A stint in the army would shake a lot of Indian youngsters out of their comfort zone and help bring about some sort of discipline in their lives. Also, a lot of armchair critics of the Indian armed forces would actually be able to empathise with those who risk their lives every single day just to protect the civilians in the country. Sometimes a good kick in the backside would do some of those born post-1990 a lot of good. I would still say the jury is out on whether conscription is made compulsory for women (it isn’t in Russia). When it comes to internet connectivity, Russia is a cut above many countries. The Moscow and St Petersburg metro have free wifi and for those who have long commutes to work, this is a real blessing. There are also many wifi hot spots on the streets of big cities. In the smartphone era, it is incredibly difficult to get lost in the largest cities in the country. Russian Railways are also planning to introduce free wifi on long distance trains. I would still prefer a Trans-Siberian voyage where people in a coupe look at each other and not at their phones, but this would be a great technological achievement. It would be amazing to have free and superfast wifi at least in places like Delhi, Bangalore and Mumbai. All three cities have a metro now and this is something that could and should be implemented. The same goes for public wifi hotspots. Banyas (saunas) are an essential and integral part of Russian life. It is a wonderful place for both detoxification and getting together with friends. Some of my most adventurous and memorable experiences in Russia have been connected with the banya. It is a tradition to jump into freshly fallen snow in the winter after warming up inside the steam room. For those less adventurous, a dip in a relatively cold pool, river or lake would do. One can argue that walking in the streets of Chennai, Mumbai or Kolkata is the equivalent of spending time in a sauna, but seriously, man of the well to do in India do go to steam rooms for the obvious health benefits. India needs more affordable and a larger number of saunas, so that a weekly trip can become a middle class experience. I will agree that women’s safety is a major concern in India and that we have a long way to go, but it would be unfair to say that it is far worse than many countries, even in the so-called developed world. However this should not stop more women from using public spaces and working, especially in Indian cities. Russia has a skewed male-to-female ratio and by default you see more women in public in the country, but it is an undeniable fact that women are far more comfortable being out in the streets and being seen than in India. We need a change in mindset in India and this is a work in progress, but Russia can be an inspiration. The country is also male-dominated and has a patriarchal society, but that hasn’t stopped women from claiming their space. India is definitely making progress, especially in the work place, where more women are visible. There is something that India can boast of that seems unthinkable in Russia: a large number of women pilots!